Also Known as the "Gateway to Thar", it is famous for its Mehrangarh fort, blue houses, temples, sweets and snacks. Apart from the fort, there are multiple temples, lakes, shopping streets that are like a mirage from a bygone era. Jodhpur is one of the most enchanting cities of Rajasthan, with its mighty Mehrangarh fort overlooking the city. An architectural masterpiece in itself, Mehrangarh Fort is a magnificent fort and is among one of the largest forts in Rajasthan. The city is called the Blue City as it looks completely blue in colour from an aerial view because of its blue walls and blue houses. Also seen in the backdrop of the movie, The Dark Knight Rises, Jodhpur attracts hundreds of thousands of visitors from all over the world. Nearby Jaswant Tada and Umaid Bhawan Palace are also among the top attractions in Jodhpur. Apart from the old blue city, Jodhpur has grown as a city with wider and cleaner roads in some parts. However, the magic lies in the old city itself with hundreds of shops, guesthouses, eating joints and vendors make it a chirpy bustling city, especially near the landmark clock tower and Sardar Market. The Mehrangarh Fort, built by Rao Jodha in 1459 in Jodhpur, is one of the largest forts in the country. It is situated at the top of a 410 feet elevated hill and guarded by massive walls. Located in the centre of the city, the fort covers an area of approximately 5 Kms of a hill. Its walls have a height of 36 metres and width of 21 metres. The intricate carvings on the walls of the fort, the sprawling courtyards, its impressive history, striking palaces, museums and galleries allures tourists from all over the world. To reach the fort, seven gates have to be crossed namely Victory Gate, Fateh Gate, Gopal Gate, Bhairon Gate, Dedh Kamgra Gate, Marti Gate and finally Loha Gate. The first defensive gate is the Victory gate which was built by Maharaja Man Singh in the year 1806 to celebrate his victory against Jaipur and Bikaner. Maharaja Ajit Singh built Fateh Pol on his victory over the Mughals. Dedh Kamgra Gate still bears the marks of cannon balls which were bombarded during wars. Loha Gate, the last one is a very special gate. It has sharp iron spikes to protect from enemies? elephants. Also, on the walls inside the gate are the handprints of Maharaja Man Singh?s widows who left the palace in 1843 to commit Sati. Within the fort, there are magnificent palaces like Sheesh Mahal and Phool Mahal which will leave you awestruck. Also, the fort has one of the well-stocked museums of Rajasthan. There are six different galleries in the Mehrangarh Museum: Elephant's howdahs, Palanquins, Daulat Khana, Armoury, Paintings and the Turban Gallery. 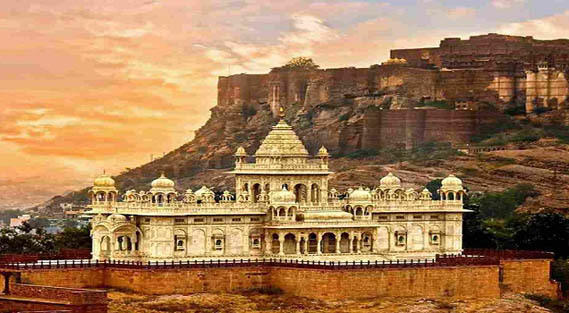 National Geological Monument, Nagnecha Mataji Temple, Chamunda Temple and Rao Jodha Desert Rock Park are the tourist attractions in Mehrangarh Fort. A wonderful amalgam of a fascinating past and a promising present, Jodhpur's Umaid Bhawan Palace is a luxury hotel which offers a taste of the regal to all its patrons. In addition to being of utmost historical value, this attraction offers amazing encounters ranging from heritage walks to unforgettable dining experiences. The hotel wing is managed by Taj Hotels and owing to its unparalleled hospitality, has been voted as the "Best Hotel in the World" at the Traveller's Choice Award. The palace was built in the year 1943 and is inhabited by Jodhpur's royal family even today. At present, the 347 - room palace has been divided into three parts. One part is the residence of the royal family, where the tourists are not allowed to enter. Incidentally, it is one of the largest private residences in the world and is currently inhabited by Raja Gaj Singh and his family. The other part houses a museum which displays a rich collection of photographs, arms, clocks, stuffed animals and many other possessions of the royal family. The third part of the palace has been converted into a five-star hotel and offers the most exquisite services to its clientele. It is one of the most popular hotels in Jodhpur. Perched atop the mighty Chittar Hill, this palace is often referred to as the Chittar Palace too. To add to the beauty of the palace, there is a beautiful garden outside with lush greenery and different varieties of flowers. A visit to this Palace can make you step into a sense of royalty. Have you ever wondered what it must have been like for the royal kings and queens of ancient India to live in their magnificent castles? If so, the Khejarla Fort is an experience worth trying out. Originally built in the 17th century by the Maharaja of Jodhpur, the 400-year old edifice has since been turned into a hotel, with amenities that exhibit contemporary luxury laid out against the backdrop of the royal fortress. The Khejarla Fort Hotel is the place to be for an encounter of rich Indian heritage, without giving up on the convenience offered by modern-day hotels. The royal hospitality provided at the hotel is quite literally the cherry on top of the cake. Situated in the desert expanses of Rajasthan, this fort elegantly brings together the natural ruggedness of its surroundings and the opulence of its royal roots. Modern style décor found within its stony exterior is a reflection of this blend. Perhaps the best part of such an experience is the opportunity to get a feel of rural India as the site is located near the village of Khejarla. It is built atop granite boulders and made of red sandstone, a signature element of Rajput architecture. The hotel also offers a guided tour of the village for a leisurely evening amongst the meadows and a taste of everyday life in the Indian countryside. The heritage fort is an ideal destination for those who wish to experience the rich cultural legacy of India while enjoying a laidback holiday soaked in grandeur. The fusion of royal and rural is what this stately fortress stands for. Jaswant Thada is a splendid monument located in the beautiful city of Jodhpur in the west-Indian State of Rajasthan. The memorial is a cenotaph built in the honour and memory of Maharaja Jaswant Singh II by his son Maharaja Sardar Singh in 1899. It is till date used as the cremation ground for the Marwar Royal Family. The beautiful edifice is made out of intricately carved marble. Visitors can explore the site and see the mesmerizing architecture completely. There are also pictures of the Royalty of Jodhpur displayed inside that give a sneak-peak into the lives of the royal bloodline. Jaswant Thada is considered as an architectural landmark in Jodhpur and must be seen by one and all. The cenotaph has a beautifully maintained garden which the tourists can explore along with the monument. Do take a closer look at the intricately carved marbles. The skilfully carved thin sheets of marble are worth appreciating. The entire structure resembles a temple with unmatchable beauty. Jaswant Thada is situated amidst the hills of Jodhpur and gives a luxurious royal vibe to the arid and rocky terrain. Evenings are a real treat here when the beautifully polished marbles reflect the warm orange sunlight. It is also called the Taj Mahal of Marwar and attracts tourists from all over the world. Famous for its beautiful verdant gardens, exquisite architecture and royal cenotaphs, the Mandore Gardens of Jodhpur is indeed a sight to behold. These gardens are located just 9 kilometres to the north of Jodhpur, in the city of Mandore, which was the former capital of the Maharajas of Marwar. These gardens are a must visit for all those who admire nature, architectural beauty and cultural heritage. Former rulers of the region took great efforts to adorn the gardens with gorgeous cenotaphs or dewals, and these structures can be found spread all across the Mandore Gardens. Unlike the regular umbrella-shaped structures, these cenotaphs have been created by taking inspiration from the architecture of a Hindu temple. Undoubtedly, the most beautiful and famous of these cenotaphs is the one that belongs to Maharaja Ajit Singh. Nevertheless, all of these red-hued cenotaphs contrast beautifully with the lush green background and make for some fantastic clicks. The Mandore Gardens are a part of the more massive Mehrangarh Fort, and also houses the famous Hall of Heroes and the shrine of Three Hundred Million Gods. The garden also has a Government Museum, which is full of artefacts and old relics. All of these attractions and exciting constituents of the Mandore garden attract tourists from all parts of the country and make sure that they do not go back home disappointed or unaffected by the sheer beauty and grace of the gardens. It is a real pity that these gardens, however, are not a very a popular tourist attraction of the Jodhpur city and that many people omit this place entirely from their itineraries. Balsamand Lake is an artificial lake located only 5 kilometres away from the central city of Jodhpur. It was created in 1159 AD by the Gurjara-Pratihara rulers. The Maharaja Sur Singh, who was the creator of this artificial lake was honoured by the title of Sawai Raja in turn of his impeccable services. Surrounded by lush gardens, it contains a large variety of trees like mango, papaya, pomegranate, etc. Balsamand Palace is an architectural marvel which overlooks the lake. All in all, this humanmade creation with exceptional scenic beauty is a place of great tranquillity. For all those who want a break from the hustle and bustle of city life, this attraction is a great destination to unwind and get away. The mesmerising lake was made famous by its adjoining estate, which is believed to be the summer home of the Jodhpur Maharajas. It is more famously known for its idealistic setting, scenic beauty, and peaceful environment. Moreover, it offers a tremendous picturesque location. You can have long walks beside its water or have dinner as you sit at Balsamand Palace's restaurant witnessing beautiful lake and sunsets views. The place must be visited for the calmness that engulfs in itself all the sorrows and gives you a mindful horizon of life. The Ghanta Ghar in Jodhpur is a magnificent clock tower in the centre of the city, built by Maharaja Sardar Singh about 200 years ago. Known as the clock tower of Rajasthan, it is a popular landmark that signifies the start of Old Jodhpur. The tower offers a brilliant panoramic view of the city from the top. The area surrounding this imposing structure is bustling with locals presenting all sorts of products and services, making it the busiest and largest marketplace of Jodhpur. The markets and the tower are a must visit for travellers who want to witness and experience the culture and people of Jodhpur. The clock tower is surrounded by street markets, with the most famous amongst them being Sardar Market, named after the late king. One can find a variety of people in this locality, representing all walks of life. At night, the tower comes to life when it is all lit up, making for a glorious end to a day well spent at this bountiful market. Om Banna temple, better known as 'Bullet Baba Temple', is a temple with an unusual backstory which may be found on NH65 between Pali and Jodhpur, near the Chotila village. This is the shrine dedicated to Om Banna, a traveller who passed away at his site, and his bike, a 350cc Royal Enfield Bullet. Located 50 km from Jodhpur and 20 km from Pali, this shrine is religiously visited by nearby villagers and devotees to pray for a safe journey and is a hotbed for tourists and travellers due to its origins. This temple is especially popular among Royal Enfield enthusiasts. Om Banna's bullet is encased in a glass case within the Om Banna temple, which stands at the site of the accident. There is also a bust of Om Banna inside the temple. The tree that Om Banna crashed into still remains at the site, with devotees praying to it along with the statue and the motorcycle to ensure safe travel across the highway. There are hundreds of devotees from nearby villages who come here every day to ensure that they are protected, and it is believed that travellers who do not stop by this temple to pay their respects are doomed to have a perilous journey. Offerings in the form of flowers, prayer strings, and alcohol are presented to the bike. The Rao Jodha Desert Rock Park was created in 2006 out of a large, rocky wasteland by the side of the famous Mehrangarh Fort. The purpose of this park was to restore the natural ecology of this neglected terrain, which has become a prime tourist attraction of the city today. The rocky ravines are densely populated with the indigenous flora of the Thar desert, counting over 200 species of plants at this ecopark. The park has a native plants nursery where native plants of the desert and rocky territories are grown from seeds and cuttings. These seedlings are planted around the park annually during the monsoons. A visitor centre is also present to provide guests with details about the plants and about the park itself. This park is a true testament to the efforts of the citizens of Jodhpur in striving to uphold their culture and keep their city alive. For the best insight into the rich culture and history of Jodhpur, look no further than the Jodhpur Government Museum. Built by Maharaja Umaid Singh it lies in the centre of Umaid Bagh, which is also known as the Public park. One can find a variety of weapons, textiles, miniature paintings, inscriptions, sculptures, metallic objects, arts and crafts at the government museum that help understand the life led by the past generations of Jodhpur. In addition to housing this fascinating museum, Umaid Bagh is also host to the public library and a zoo. The place is divided into four sections - the archaeological area, the armoury, the display of arts and crafts, and the historical section. As the royals of Jodhpur were fierce warriors, this museum displays quite a bit of its military history. Along with a beautiful range of carefully preserved antiques, military plane models and battleships are also displayed here. There are stuffed animals showcased as well, portraying the indigenous fauna of the region, a sight that is very well received by the children who visit. The range of the exhibits dates back to almost the 6th century. The Phool Mahal, or palace of flowers, is the most lavish hall present in the Mehrangarh Fort. Built by Maharaja Abhaya Singh in the 18th century, it served as a pleasure dome for male members of the royal family. It is said that this was the site where he would be entertained by female dancers. It is less accessible as compared to the other rooms of the fort, indicating the private use and exclusivity of this room. The design and style of the room can remind one of the extravagances experienced by the royals of Jodhpur. As this room was meant for leisure, the Maharaja went all out when decorating, making it the most ornate hall of the fort. The idea of the design was to make it look like a beautiful flower, thus the name 'Phool Mahal'. The hall is decked with gold, with the ceiling being inlaid with gold filigree. There are glass windows and mirrors within to amplify the magnificence. There is a marvelous and pleasing splash of colors as a result of the palette used to create this wonder. Many beautiful portraits and paintings of the 18th century may be found, especially those from the famed Raga Mala series, combined with furniture from the British period to enhance the glory of the room. The place is abundantly adorned with gold as a sign of royal splendor. One of the best road trips from Jodhpur, the man-made Sardar Samand Lake is a favourite among those looking for a weekend getaway from the city. Situated approximately 50 km away, it is one of the more pristine lakes present in the region, with countless migratory birds approaching its banks to enjoy this serene location. Atop the hill overlooking the lake is the former summer palace of the royal family, now converted into one of the most coveted heritage hotels in Rajasthan, giving travellers a true essence of living in a regal era. While its prime attraction is the breathtaking view of Sardar Samand lake, the palace also offers a tennis court, squash courts, oriental gardens, swimming pools, cycling and jogging trails, and a boathouse. The grand palace and its interiors are designed in the charming Art Deco style, with 19 air-conditioned rooms which are well-stocked to provide visitors with all the luxuries required to perfect their stay at this resort. By the lake, one can see fascinating bird species like the yellow-legged green pigeon, the Himalayan Griffon and the Dalmatian Pelican. Animals like the blue bull, gazelles, and the blackbuck may also be seen beating the heat at this watering hole. The Sardar Samand Lake and the Palace make for a perfect weekend getaway, to spend some time in tranquility, away from the din of the city life. Moti Mahal is the largest and brightest room of the five historic rooms present in the Mehrangarh Fort. Also known as the palace of pearls, it has earned this title through the use of finely crushed seashells and lime plaster brilliantly combined together to give a pearly, polished look to its magnificent surface. This exquisite room is an aesthetic dream come true, adorned with complementary design elements of gold leaves, seashells, mirrors, and the colourful windows, all coming together to please the eye. History buffs will find it interesting to know that the five alcoves located in the room were actually hidden balconies, through which the five queens of the Maharaja would silently listen to the proceedings. As the king's main hall for carrying out his daily duties regarding his subjects, this is the largest and grandest room of the fort. The walls are made of a mixture of lime plaster and finely crushed seashells, giving it a pearly finish, hence the name Moti Mahal. These walls are punctuated with colourfully stained glass windows, throwing an array of colour into the room. The royal throne was placed at the head of the chamber in the centre, with cushions provided along the sides of the room for seating of the ministers during private meetings. The final touch comes from the ceiling, adorned with gold leaves, seashells and mirrors to give the place a complete air of regality. This magnificent hall is said to be the site for the coronation ceremony of many rulers of Jodhpur. A characteristic feature of the royal Rajput architecture, the Sheesh Mahal in the Mehrangarh Fort of Jodhpur is a treat to the eye of the beholder. Known as the Glass Palace of Jodhpur, this marvellous piece of historic architecture is decked from ceiling to floor with fanciful mirror work. These decorative ornaments are complemented well with the brightly coloured paintings of various religious figures made in plaster. This beautiful room is a pleasing juxtaposition of superimposed mirror works and bright paintings of various religious figures across the walls. The numerous decorative panels show deities like Lord Brahma, Lord Shiva and Parvati, Lord Krishna playing the flute, Lord Rama among others showing the strong influence of religion and culture on the art of the time. The ceilings and floors are inlaid with mirrors, earning the room the title of Hall of Mirrors. The blue, green, silver, and gold ornaments suspended on the ceiling as well as the grand European chandelier are later additions to this hall. Mehrangarh's Sheesh Mahal was the bedchamber of Maharaja Ajit Singh who reigned over Jodhpur between 1679 and 1724. Experiencing the culture of the Bishnoi community is a vital part of any leisure trip to Rajasthan. The Bishnoi Village tour comprises four villages spanned across four hours, where one can absorb and witness the authentic traditions and lifestyles of rural Rajasthan, a continuing tribute to the original way of life present in Marwar. This tour spans an average of 6 hours, allowing travellers to witness the simplicity and peace of a time forgotten. As Bishnois are staunch protectors of the environment, many animals and birds are seen naturally coexisting in and around the areas of the villages. A rare sight in the rest of the world, it is quite delightful to look at these creatures go about their daily routines unencumbered by the worry of being hunted or run over. The full tour package includes five significant stops designed to help travellers understand the history and culture that has shaped the Bishnoi tribe to what we see today. Common rural occupations like sheep-herding, weaving, and pottery are practised here, and visitors to the villages have the opportunity to view, learn and purchase these finely-crafted products manufactured in these areas. The tour also includes a visit to Khejarli, site of the Khejarli massacre where 363 Bishnois lost their lives trying to save the forest, and the breathtaking Guda village, a glorious location perfect for an Instagrammable moment, with the natural scenery being complemented well with the local biodiversity. Gaining popularity amongst the younger population is the Jodhpur RIFF, which started off in 2007. It was an initiative of the current ruler, HH Gaj Singh, which aimed at providing a huge platform for the folk artists of Rajasthan. The festival sees collaborations between the Indian folk and international musicians. What is more, Sir Mick Jagger, the frontman of the rock band 'The Rolling Stones', is the international brand ambassador for this festival. The Jodhpur RIFF usually takes place around 'Sharad Poornima', and hence, the dates always vary. Located two kilometres away from Jodhpur on the road towards Mandore, it is a very big temple with he fantastically carved 84 pillars which are a sight to behold. Other important temples of Jodhpur include Chamunda Mataji Temple which is located inside the Mehrangarh Fort, Baba Ramdev Temple, Ganesh Temple and Pal Balaji Temple. The most popular festival, Marwar Festival, is all about celebrating the bygone heroes of Jodhpur. Held at the Mehrangarh Fort and Umaid Bhawan Palace, this festival has evolved over the years and is now the epitome of showcasing the culture of the 'Blue City'. Marwar, was founded by Raja Rao, in the year 1459. He was the chief of the Rathore tribe of Rajputs. This festival specifically is a celebration dedicated to all of the Rajput heroes, as they stood for an important quality in the battlefields, bravery. However, this festival now stands for much more. The Marwar Festival showcases the amazing talent that Marwar has, what with the numerous folk musicians and dancers residing in it. The folk artists are given a chance to show their talent to the tourists visiting this festival. Apart from the musical events, the Marwar festival also has other events like - Puppet shows, Horse Polo, Camel Tattoo show and much more! This festival takes place over the course of two days between September and October. This festival is a major celebration for all of the kite-flying enthusiasts. In its inaugural ceremony, at the Polo Ground, a number of helicopters release a number of kites, along with children releasing a number of balloons. There are two major competitions held during this festival: the Fighter Kite Competition and the Display Kite Competition. The final round of the competition is held in the Umaid Bhawan Palace. So, if you are planning to visit Jodhpur in the month of January, do plan it around the 14th of January (Makar Sankranti)! Where the Nagaur Fair is concerned, it happens to be the second largest one in all of India. It is conducted in the town named 'Nagaur' and is primarily known as a Cattle Fair. This fair is all about the trading of animals, wherein the animals are presented with colorful accessories upon them. But, this fair is much more than that. It is particularly popular because of its sporty activities like the tug of war, and bullock and camel racing that it showcases. The Nagaur Fair is an eight-day affair, which takes place between the months of January and February. While this is a world festival, the World Sacred Spirit Festival is going to be held in Jodhpur in 2018. This festival has a number of Sufi performances and is a major crowd puller. What could be better than witnessing a divine performance with the Mehrangarh Fort in the backdrop? This is one event which no music lover can miss out on. It will be conducted in the Nagaur Fort (12th, 13th, and 14th February), and the Mehrangarh Fort (16th and 17th February). While this is a world festival, the World Sacred Spirit Festival is going to be held in Jodhpur in 2018. This festival has a number of Sufi performances and is a major crowd puller. What could be better than witnessing a divine performance with the Mehrangarh Fort in the backdrop? This is one event which no music lover can miss out on! It will be conducted in the Nagaur Fort on 12th - 14th February, and the Mehrangarh Fort on16th and 17th February. The largest and busiest marketplace of Jodhpur, Sardar market is named after Maharaja Sardar Singh, the king of Jodhpur responsible for building the Ghanta Ghar which lies near the market. This is the most famous shopping zone of Jodhpur and attracts customers from all parts of Jodhpur, Rajasthan, India, and the world. The marketplace is abundant with everything a shopper could dream of buying, with locals selling all sorts of products such as local fabric, clay figurines, silver jewellery, grains, spices, marble, pottery, vegetables, and many more products. One can find the traditional products of Rajasthan within this area. There is a cornucopia of food and beverages, giving travellers the most authentic experience of a Rajasthani market. It is advisable to try out local delicacies around here to complement the visit to this state. If shopping and food are not enough of an attraction, one may also visit this marketplace merely to observe the variety of people who come here. Colourfully dressed people from all walks of life can be seen throughout the locality, be them customers, tourists, or vendors. This is what gives this area its life and vibrancy. The Ghanta Ghar, or the clock tower of Rajasthan, is a majestic sight that lies beyond the market. Regarded as the 'salt city' due to being densely populated by salt industries, Phalodi is a delightful little town in the Jodhpur district, located between Jodhpur and Jaisalmer. Positioned near the edge of the Great Thar Desert, this charming little village is home to some notable historic structures such as the Lal Niwas and the Phalodi fort, excellent examples of traditional and indigenous Rajasthani architecture. There are a significant number of temples that are relevant to Hinduism and Jainism. The Khichan bird sanctuary, famously known as the Demoiselle Crane Village, is an ornithophilous treat, with various species of birds spotted in here, including the famed Demoiselle Crane. A fascinating part of this town is the handiwork of the people. 'Jootis' are commonly found here, the embroidery of the shoes being unmatched by any other part of India. One can also find colourful bangles, traditional jewellery, and the famous heavy woollen fibre 'Pattu'. Being at the edge of the desert, Phalodi is prone to extreme climates of summer and winter. The traditional housing system of havelis is ever present in this town. Spread across the top of the Masuriya hills is the beautiful Masuriya Hill Garden, a delightful location providing travellers with a 360-degree panoramic view of the city of Jodhpur. Inside, one can find a statue of Veer Durgadas Rathore, a prominent hero amongst the Marwari community. The area is also host to a temple of Baba Ramdev, a local deity. This marvellous vantage point is also home to one of the largest TV towers in India. The famous Mehrangarh fort can be seen at a distance, situated on the opposite side of the city. The garden lies in aesthetically appealing contrast to the rugged rocks located along the road up the hill. Situated well within the city limits, it is a favourite spot among locals for its panoramic view and amazing sunset experience. The area also houses a restaurant and a playground to keep its guests engaged and refreshed during their visit. The silence can be attractive to those looking for a slice of peace in an otherwise busy city. If you’re looking for a place to chill after a long day of sightseeing, then Shastri Circle should be a place on your list. A lively and vibrant part of the city, it is considered a relaxing hangout spot by the locals. The evenings see a musical fountain show with lights to jazz it up. There are many eateries surrounding this area and a playground with swings and parks for children. This is an ideal spot for travellers to take a break from all the tourist spots and just enjoy a relaxed and entertaining evening when in the city of Jodhpur. Post 6:30 PM, there is an entry charge as the light show and musical fountains are organised as entertainment. There is also horse riding and a walking track. Located 8 km to the west of Jodhpur, the Kaylana Lake is a massive manmade lake, covering a surface of 84 square km. Constructed in 1872 by Pratap Singh, it serves as the primary resource for drinking water for the citizens of Jodhpur and other neighbouring settlements. A peaceful location, this lake is a must visit for most travellers who are road tripping between Jaisalmer and Jodhpur. It also serves as an excellent viewpoint for sunsets in Jodhpur. The pristine lake is surrounded by Babul trees, hills, and rock formations, granting travellers many picturesque sights across its boundaries. A favourite among bird watchers, one can find a variety of bird species beating the heat of Rajasthan while enjoying the cool breeze of the lake. The Siberian Crane can also be spotted here during Winter. Visitors may avail boating services to truly explore the area or can have picnics by the lake if they are looking to relax in a serene and calm environment. Kaylana Lake is a great place to connect to various other tourist sites near Jodhpur, such as the Machia Biological Park, the Machiya Fort, and various Shiva temples. These sites are all within a 5 km radius of the outskirts of the lake. Situated 70 km south of Jodhpur, Pali is famously known as the industrial city of Rajasthan. It has been a hub for merchant activities for generations and is a great site to visit to learn and see the history associated with Rajasthan. One can find many temples in and around the city to satiate their taste for culture and history while also see numerous industries of Rajasthan, with Pali being a famous exporter of textiles such as cotton and synthetic materials. This beautiful city is home to a number of famous temples like the Somnath temple, Adishwar temple, and the Ranakpur Jain temple. Not too far from here is the infamous Om Banna temple, also known as the Bullet baba temple, a unique temple that can not be found anywhere else in the world. The Bangur museum is a great place for artphiles, while the Nimbo ka Nath is hugely significant, believed to the residence of the exiled Pandavas from the legend of Mahabharata. For nature enthusiasts, the Lakhotia gardens and the Pali National Park will make this stop worth your while. The fort of Auwa, a landmark playing an essential role in the Indian freedom struggle is also found here. The city of Jodhpur has a little something for everyone. A splash of art, a rich collection of history, a plethora of culture, and even something for the adrenaline junkies. The Flying Fox Zipline Tour is arguably the most memorable way to experience the Mehrangarh Fort, a key attraction of the blue city. A well-organised setup of six zip lines, this tour covers the walls, the bastions and the lakes of the fort, spanning an estimated time of two hours. Not only is it the best activity to get your heart racing, participants are also treated to a unique breathtaking collection of views of the picturesque city and the majestic fort. For those apprehensive about adventure sports, the Flying Fox organisation takes utmost care in installing supreme standards of safety. The tour was started in 2010, and has over 50,000 satisfied participants. The organisation also makes arrangements for the differently abled. The activity begins with a short walk up the fort, followed by a safety brief and practice session before the actual zip lining begins. The six zip lines are Chokelao Challenge, Ranisar Rollercoaster, Chhota Wallah, Jai Jodha, Rajputs' Revenge and The Magnificent Marwar, each an exhilarating experience by itself. Travellers wanting an authentic experience of tribal life in Rajasthan will eventually find their way to Guda Bishnoi Village. Approximately 22 km from the city of Jodhpur, the site is a hotbed for scenic beauty and exotic wildlife. The Guda Bishnoi Lake, an artificial lake by the village, is a sight to behold, serving as a watering hole for a large number of birds and animals. Travellers who stay here will receive the opportunity to experience the real village culture of Rajasthan. This village is inhabited by the Bishnoi community, one of the tribes of Rajasthan. As they are committed to the worship of the different forms of nature, they are devoted to the protection and conservation of the natural environment around them, along with its varied inhabitants. Upon visiting the village, one can find antelopes, Blackbucks, Demoiselle cranes, Saru cranes, spotted owls, rabbits, gazelles, blue bulls, and peacocks. One can also see these animals going about their natural routines by Guda Lake. Umaid Heritage Art School, Jodhpur Overview Situated in the heart of the city of Jodhpur, the Umaid Heritage Art School is an art gallery as well as an art school for the people wishing to see and learn the traditional artwork of Rajasthan. Many famous and budding artists are associated with this school, where one can learn and view painting, sketching, charcoal work, as well as the world famous Rajasthani miniature painting style. This school also offer short free lessons on traditional Rajasthani forms of painting for children and adults. The Umaid Heritage School has been owned and managed for the past eleven years by Mr Vijay Raj, a great connoisseur of art and exceptionally talented in sketching, portrait making, and the miniature painting style of Rajasthan. The expertise of Gaurav Solanki, a renowned artist, specialised in the use of graphite and charcoal, are also found and shared here. Free miniature painting lessons are offered to all travellers, and artwork using oil, watercolour, graphite, charcoal, and many more mediums may be found and taught here. Located at the end of Mehrangarh Fort, Chamunda Mata Temple is one of the oldest and most revered temples in Jodhpur. The Goddess is considered the main deity of the inhabitants of Jodhpur and is regarded as the 'Isht Devi' or adopted goddess of the royal family. This holy temple attracts a lot of devotees and worshippers, especially during festivals of Dussehra and Navratri, and is considered a site of pilgrimage among many Hindus. It stands atop the Mehrangarh Fort, with its white top blending well in the backdrop of the rich blue sky, providing visitors with a serene view of the blue city of Jodhpur. It can be quite a tranquil spot to enjoy the city except during festivals. The grand edifice was built along with the fort by Rao Jodha, the founder of Jodhpur and a fervent follower of the Goddess Chamunda Devi. This charming little temple serves as a great way to conclude one's trip to the majestic Mehrangarh Fort. One can view it as a place of peace for the royals of the past, coming to this pleasant site for its calming and restful ambience, finding a moment's escape from the responsibilities of their daily routines and the anxieties of maintaining a kingdom. The location inspires one to find their inner peace and strength to face the journey ahead of them. The Ranisar and Padamsar lakes are two adjoining lakes in the city of Jodhpur built over 500 years ago. They are situated at the rear of the Mehrangarh Fort, near the Fateh Pol. These scenic lakes were created to conserve water, as Jodhpur falls under a desert region where water is scarce. The tranquillity of these adjacent lakes is complemented brilliantly by the stark contrast of the majestic Mehrangarh Fort, making it a sight to behold. The clear waters have been preserved and maintained for centuries, providing a serene vibe and an almost identical reflection of the grand fort on its surface. The development of the two lakes was commissioned by two different queens in the 15th century. Ranisar lake was made on the orders of Queen Jasmade Hadi, wife of Rao Jodha, the founder of Jodhpur. Padamsar lake was created by Queen Padmini, the daughter of Rana Sanga of Mewar. These lakes were built to conserve water in the desert region, serving as excellent examples of the age-old tradition of royal women being in charge of overseeing the public water systems. They represent the classic water storage systems that are ever present throughout this region. They are considered a consistent source of water in the city. Considered the oldest temple of Jodhpur, the Mandaleshwar Mahadev Mandir was built in 923 AD by Mandal Nath. This ancient temple is dedicated to Lord Shiva, and has been beautifully decorated with various exquisite paintings of Lord Shiva and Goddess Parvati. The serene vibe of the place complements the elegant design of the shrine. The temple is also known as Mandalnath Mahadev Temple. This charming little shrine is immaculately carved and coloured, the major theme being white with splashes of blue, pink and green alternatively adorning the external surface of the structure. Inside the shrine lie the main idol of worship, the Shivlinga, complemented well by the beautiful paintings on the walls. Despite being over a 1000 years old, the temple has withstood the test of time, being preserved and maintained well by authorities. The structure is a great reminder of the ancient styles of architecture practised in the course of Indian history. Its religious significance combined with its historic value gives it a place among the major temples one should visit when in Jodhpur. Machia Biological Park is an essential part of the agenda for nature lovers travelling to Jodhpur. Located about 8.5 km from the city, this biological wonderland is a part of the vast Machia forest block, situated close to the Kaylana Lake. It is a host to varied species of flora and fauna as well as a nature interpretation centre and the Machia Fort. Along with the enclosures for the animals, one can also find a birdwatching point, proof of the site's fantastic biodiversity. The premises houses a veterinary hospital for maintaining the well-being of the animals inside. Elephant riding may be availed by travellers for a small fee. There is also a bird watching point for bird lovers. A nature interpretation centre has been set up for those seeking an in-depth experience of the ecology and biodiversity. The Machia fort can also be found here, which offers some breathtaking views from the top, especially during sunset. The Kaylana Lake is quite close to this area, and there is a viewpoint within the premises to observe the lake. It is home to multiple wild animals such as the deer, desert fox, monitor lizard, rabbits, feral cats, gazelles, mongooses, tortoises, etc. Management is consistently on the lookout for suitable additions to the park. There are a total of 20 enclosures within the park. There are walkways constructed around the park for visitors to witness the various animals in their natural habitats. One can also find a variety of arid vegetation maintained within the site. For those who do not prefer a lot of physical activity, motor vehicles are available for use. A trip to the desert would be incomplete without a camel safari across the seemingly endless expanse of the sandy terrain. With Rajasthan being the desert state of India, a trip to this cultural oasis will only feel complete by availing a camel safari. The city of Jodhpur offers multiple packages of varying durations for its visitors. The shortest of these safaris allows one to travel 70 km across the glistening sheets of golden sand of the Thar desert to the ancient town of Osian, steeped in cultural history significant to both Hindus and Jains. If you're feeling especially adventurous, there are packages offering travellers the opportunity to undertake the incredible journey from the blue city of Jodhpur to the golden city of Jaisalmer, spanning roughly 250 km of the mesmerising desert. Despite the name 'Camel Safari', tour operators go the extra mile to ensure that their guests have the best experience. Depending on the time and budget allocated for this activity, it is usually inclusive of meals, stay (in case of overnight tours), and mingling with the locals through conversation, folk music and folk dance, along with the main attraction of riding the famous ship of the desert. The arduous task of traversing through the desert, faced with the reality of the arid region and the magnificence of the golden dunes and vast stretches will grant travellers the opportunity to live the authentic life of a desert dweller, and it is definitely an experience worth having. Constructed in 1740, Toorji Ka Jhalra, commonly called stepwell of Jodhpur, is an intricate design of stepwell, one of the few remaining structures depicting the traditional water management systems of Jodhpur. This architectural wonder was built by the queen-consort of Maharaja Abhaya Singh, a sign of the age-old tradition of the region where royal women were in charge of overseeing the public water works. The design and structure help onlookers comprehend the lifestyle of the earlier generations who had used it in its prime, with the site serving as the local watering hole for its time. This 250-year-old structure was made using the famous rose-red sandstone found in Jodhpur. More than 200 feet in depth, it was once adorned with intricate carvings of dancing elephants, medieval lions, cow waterspouts, and niches that showed various deities. There were two levels of access and a separate tank which were meant to receive water from the wheel system powered by the bullocks. Its impressive design attracts many tourists, and is regarded as a fun place by locals and visitors to engage in harmless, recreational water games in order to beat the heat. The full tour package includes five significant stops designed to help travellers understand the history and culture that has shaped the Bishnoi tribe to what we see today. Common rural occupations like sheep-herding, weaving, and pottery are practised here, and visitors to the villages have the opportunity to view, learn and purchase these finely-crafted products manufactured in these areas. The tour also includes a visit to Khejarli, site of the Khejarli massacre where 363 Bishnois lost their lives trying to save the forest, and the breathtaking Guda village, a glorious location perfect for an Instagrammable moment, with the natural scenery being complemented well with the local biodiversity.